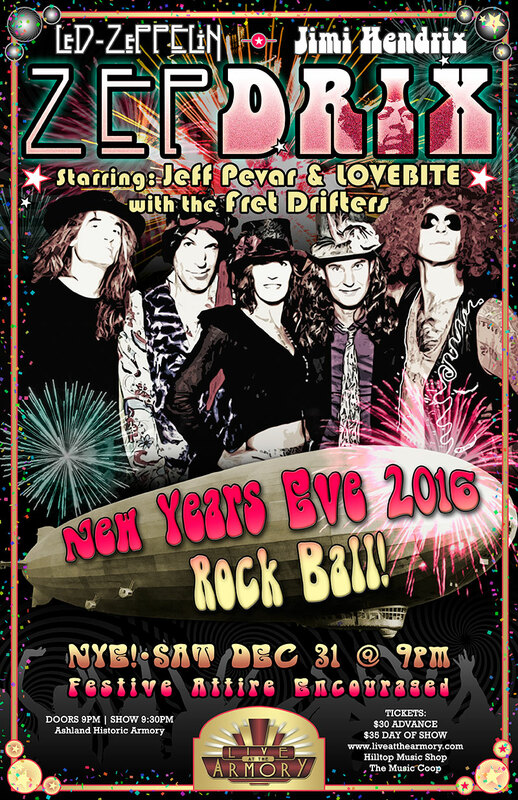 Ring in the New Year rock ball style! In the history of Rock & Roll, very few are as impactful as these iconic names: Led Zeppelin & Jimi Hendrix. Back by popular demand, ZEPDRIX (featuring members of LOVEBITE some very special surprise guests) will dig in to the funkiest, deepest, classic Led Zeppelin- and Jeff Pevar Project will bring the legendary music of Jimi Hendrix as it was meant to be played. We are also very excited to announce that our friends The Fret Drifters, Andy Casad & Nick Garrett Powell will be opening the show and joining us for a finale at the end of the night. Our intention is to bring the highest level of musicianship, combined with a connected experience that can leave you with groove in the heart and a little piece of the joy, freedom & inspiration we feel by honoring these legendary artists. Festive Rock & Roll semi-formal attire is strongly recommended, but not mandatory…anything goes on this wild night! This Rock excursion, "ZEPDRIX”, Features renowned guitarist, Jeff Pevar (Crosby, Stills & Nash, Ray Charles, Marc Cohn, Rickie Lee Jones, Phil Lesh & Friends, Jazz Is Dead, Bette Midler, Joe Cocker, & many more) joined by Soul, R&B & Rock Vocalist, Inger Nova Jorgensen, Guitarist Paul Turnipseed, Bassist, Jacob Ackerman and a Very Special Surprise Guest Drummer who previously toured with Pink Floyd Guitarist, David Gilmore! The project was born out of a Halloween concert in 2014 when the Funk-inspired band, LOVEBITE, decided to host a Rock & Roll themed concert/costume party performing the music of Led Zeppelin & Jimi Hendrix. ZEPDRIX recently sold-out the Rogue Theater in Grants Pass and last years show at the Ashland Armory was voted Concert Of The Year!. The guitar prowess of Jeff Pevar (www.pevar.com) combined with passionate, soaring, female vocals by Inger Nova Jorgensen adds a unique spin on this iconic Zeppelin music combined with a robust rhythm section and inspired Guitar with Paul Turnipseed. Additionally, Pevar delivers the Hendrix material with ferocity and abandon. This unique show offers a fresh interpretation on these legendary rock artists.